Yesterday was a cold, windy day and our lights had been flickering all day, making me wonder if our power would go out during the night. As I thought about the possibility of a cold night, it made me realize how fortunate we are with what we have. We not only have the ability to warm our house in these cold temperatures but we can provide hot meals to our families provide warmth & nourishment to keep our kids healthy. The reality is that many Americans do not have this same luxury. They may have no heat or may even be out on the streets in this weather. There are families who can’t afford to provide hot meals for their kids. Childhood hunger is affecting more & more American families with 16 million children struggling with hunger issues. We wanted to highlight one simple idea that you can do with your family to reach out to those around you who are struggling. For several years, my family has been creating Blessing Bags to keep in our car so we can hand out to people we see in need. When you see people who are in need & want to help but aren’t sure how to respond, this is a great option as you’re providing for some of their basic needs with toiletries, first aid items, snacks & more. My girls get very excited about being able to stop & help someone on the spot, so we try keep these stocked in our car whenever we can so we can help if we see someone in need. We thought we’d take this a step further by creating Blessing Bag Meals, with ready to eat meals & snacks to share a meal with those in need. 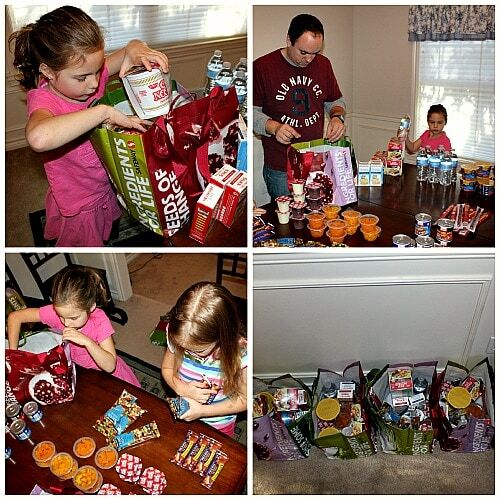 The best part of this is that it’s an easy way to get your kids involved in putting together these Blessing Bag Meals. My girls had fun compiling the meal bags and it was a nice opportunity to share with them about the struggles that many Americans face with homelessness & hunger & ways we can help as a family. We focused our Blessing Bag Meals on people who are homeless, so we made sure that everything would be something that could be easy to eat in any location. Find foods that are ready to eat or only need hot water to eat. Everything should be individually packaged. I bought all of my ingredients at Costco & Winco as I was able to find a number of inexpensive items to put in the bags by buying in bulk or at an inexpensive store like Winco. Putting together a Blessing Bag Meal doesn’t need to be expensive as you can find low-cost items to include & many items could also be bought with coupons & store sales to save even more. We put together bags filled with ready to eat food items for around $15/bag & you could pay even less if you shopped the sales & used coupons. Mac ‘n Cheese in a Bowl – I made sure to choose bowls so they didn’t have to worry about finding a plate to be able to eat it easily. Pudding Cups (it’s nice to have a little treat!) 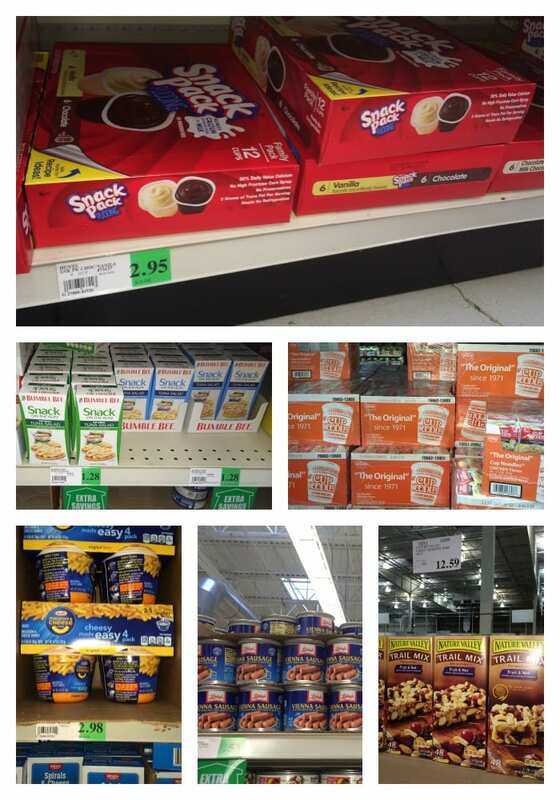 – these were significantly cheaper at Winco when you bought in a bulk package of 12 versus a package of 4. Reusable Shopping Bag (you can use any bag you’d like but I picked a reusable bag so that it would be something easy for them to carry around that wouldn’t fall apart when wet and they can then reuse it to carry some of them items if needed). I found the bags I used at Safeway for $.99 in their clearance section. List of Resources for that area – you might want to provide a list of resources such as a local food bank, clothing bank, homeless shelter. Also, you can write down the number “211” as a resource for anyone to call to find emergency shelter, food, & more services. Personal Note of Encouragement – this is a nice way to make the bags more personal & encourage the recipient of your bag. You could include a bible verse or inspiring quote along with it. 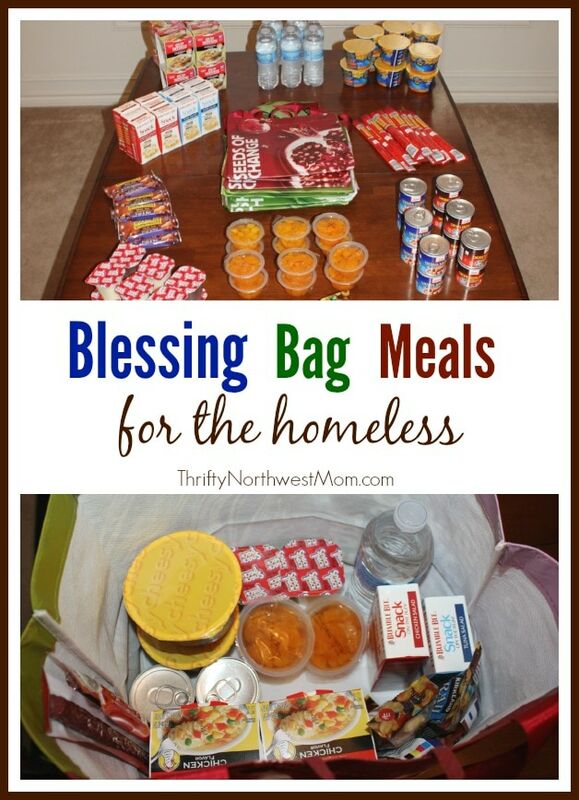 Once you’ve assembled your Blessing Bag Meals, you can keep them in your car & hand out the next time you see someone in need while you’re out & about. You could also hand out with a regular Blessing Bag as well, so they can get the needed toiletries, first aid items, etc. You could also find a local homeless shelter & donate the bags there so they can hand them out to people who can use them. With the holidays coming up, you may be hosting a holiday party. This is the perfect time to ask your guests to bring an item off your list to contribute towards the Blessing Bag Meals. By compiling items at a party, it’s an easy way to crank out a number of bags. You could just collect the items & put together later, or just take time during the party to work together assembly-line style to put together the meal bags fast. It’s a way to have a fun evening with friends while also doing a service project together. It’s also the perfect activity for a work get-together or Mom’s group meeting. Have people sign-up to bring specific items so you get a good variety & then you could put these together very quickly in an assembly line fashion. Every person could take one home with them to keep in their car to deliver to someone they find in need. Or you could share the meals with a local homeless shelter to pass out to those who are on the streets who come in for shelter. You can see how well it works to set up all the like items together & then put together the bags with an assembly line. We did a mini assembly line with our items in our house & it was a great way to get my kids involved in putting together the bags. We now have our Blessing Bag Meals ready to go in our car so that when we see someone in need we can hand them out. This is just a simple way that we can share a meal with someone in need & reach out to show them we care. If you’d like to also include a bag of necessities – check out our popular Blessing Bag post with a list of items to put in a gallon size ziploc bag to keep in your car to hand out to those in need! They’re full of necessities like first aid supplies, toiletries, hand warmers, snacks & more! 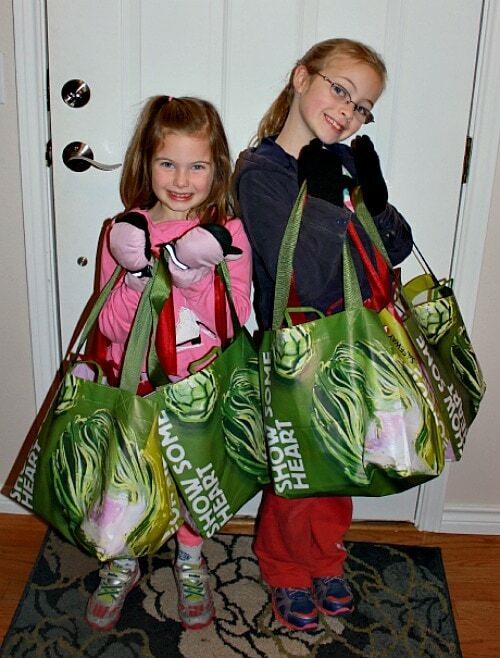 Very simple bags to put together, but it can be an immediate way to give to someone. We’d love to hear any ideas you have for how you can help make a difference in ending childhood hunger & ways you have gotten your kids involved in helping others! What a great project and way to give back! I really love the blessing bag meals!